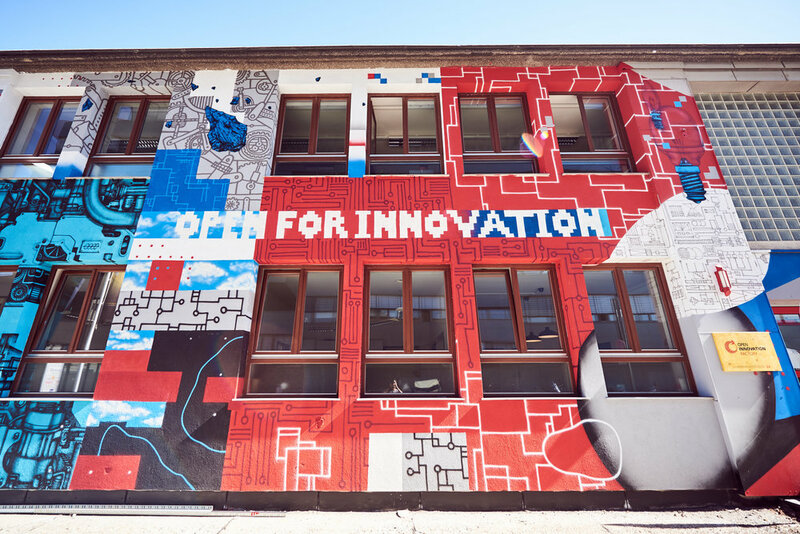 In 2018, we collaborated with the OEBB (Austrian Federal Railways) and with four Austrian artists, namely Ruin, Perkup and Friend, to paint over the facade of OEBB's new Open For Innovation Factory in Laxenburgerstraße, 2A, 1100 Vienna. The goal of OEBB's Open Innovation Platform is to involve people in the development of new products and services. The Platform will serve to present current questions, to share new ideas and to initiate a discussion. The OEBB Open Innovation Factory has been enhanced with an artistic street art intervention. The purpose of the artistic design wasn’t only to embellish the grey facade, but also to include and display the different topics addressed by the innovation team. For the confectionery manufacturer MAOAM we curated the design of a wuzzler, together with the artist Zahra Shababi aka Z. The football table was then raffled by the online community and advertised on different packagings. This was an exclusive edition, limited to 50 pieces and produced in a fully sustainable way. Together with the Albertina Museum and Wiener Linien, we are transforming an ordinary site fence into a temporary exhibition with photos of works by Keith Haring. Several construction sites in the subway station were visually enhanced to bring art closer to the passengers during their commutes and to draw attention to the work. In occasion of the charity campaign "Hoffnungswauwau" run by Licht Ins Dunkel, the interior design company AREA provided the sculpture designed by Eero Aarnio. The Viennese street art artist SKIRL turned the puppet figure into a work of art with vibrant lines. The proceeds were donated to Licht Ins Dunkel. Together with LEAP Art Prints, we curate the production of various limited edition screenprints, designed by international artists during the festival. The autographed prints are limited to 35 pieces and can be purchased by contacting us or during the Calle Libre festival taking place yearly in August.